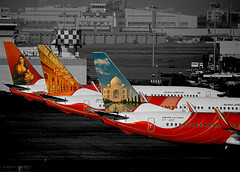 Over the past five decades, Boeing has been the country’s largest exporter and earner of foreign capital; a major innovator of high-end technologies and a major user of them; the custodian of knowledge about designing and integrating the numberless systems and parts of which a modern airliner is made. No other American company has that knowledge. Elsewhere in the world only Airbus and Russian industry have it. For now, many would say. Boeing has elected to outsource a sizable body of knowledge. The greater part of its new airplane, the 787, is being built elsewhere, with Japan’s three major aircraft companies in the lead role. Boeing’s close and productive ties with them have at times raised questions, although never to the same extent as now. Could these companies use what they have learned from Boeing to build and market their own large commercial aircraft? Has Boeing, in effect, ceased to be a maker of large commercial aircraft? And if so, why? The 787 program is stretching technology to its outer edge, starting with the wing, the smart part of any airframe. In the art of making wings for commercial aircraft, Boeing has had few peers. Now it has outsourced the wing of the 787, the first to be made partly of composite material, to the Japanese “heavies”—Mitsubishi Heavy Industries, Fuji Heavy Industries and Kawasaki Heavy Industries. They are also responsible for a section of the all-composite fuselage. And Boeing has licensed the design and manufacturing technologies involved in composite materials to the Japanese. Alenia of Italy and Vought Aircraft are producing the center and aft fuselage sections, along with the airplane’s horizontal stabilizer—in all, 26 percent of the structure. Boeing itself is supplying roughly 35 percent of it, including the vertical fin, the fixed and movable leading and trailing edges of the wing. Boeing and Airbus have always outsourced subcomponents and systems to suppliers. In the case of the 787, however, Japanese suppliers are acquiring so-called core competences, starting with wing technology and the new lightweight materials. Hence, critics say, Boeing is giving up its competitive edge by outsourcing the major parts of the 787 with the new materials. Also important to Boeing is gaining low-cost financing from the world’s second-biggest economy. Early in the new century, Boeing began reacting to the Airbus surge and its own stumbles in the marketplace by searching, especially in East Asia, for strategic partners. In return for aircraft sales in these countries, Boeing would allocate production and design work on its aircraft. For a company as versatile as Boeing and as endowed with exceptional resources, the alternative to making airplanes is assembling them as a systems integrator. And that is what Boeing is doing with the 787. Being a systems integrator means shifting the financial risks to suppliers, especially those who, like the Japanese and Italians, are subsidized by their governments. The current controversy is largely an internal Boeing affair. It pits management against other sectors, especially the engineers. Not surprisingly, they take exception to the outsourcing of core components, since much of the work for which they would have been responsible has gone. That aside, many of them are convinced that the company has lost sight of its larger interests. Their worst-case scenario envisages Japan designing airplanes and outsourcing some or much of the fabrication to Korea and eventually to China. Pierre Chao, one of the most carefully listened to among industry analysts, takes a balanced view. He says Japan, theoretically the biggest of the potential competitive threats, has been constrained for the last two to three decades because Boeing has co-opted its industry. Various parts of the Japanese bureaucracy have wanted to develop an indigenous commercial aircraft product line, but industry has refused to go along because of their lower risk and more lucrative role as subcontractors to Boeing. Until recently, the received wisdom was that Airbus, unlike Boeing, wouldn’t outsource core competences. But the overarching importance of the Asian airline market has altered a few basic assumptions. China is a huge market and demands technology in return for granting access to it. Four Chinese manufacturers are making wing components for Airbus aircraft. Six companies are making its landing gear. In June 2006, Airbus disclosed its plan to build an assembly plant for A320s in the coastal city of Tianjin. The same document reported a joint venture between Airbus and China Aviation Industry Corporation I establishing an engineering center adjacent to the offices of Airbus China. In late 2005, Airbus served notices on suppliers that it had tightened its criteria for contractors with whom it works—including a requirement that major suppliers outsource a minimum amount of work to companies in Asian countries such as China and India. The mandate was described as part of a broader global “action plan” in which Airbus is seeking partnerships in China, Russia, and elsewhere, specifically for development and production of the A350. In 1992, Boeing’s share of the world market for airliners was 70 percent. But with American carriers postponing orders worth many billions of dollars, Boeing had become dependent on sales to foreign airlines, especially in East Asia, where economic growth and power were by then concentrated. In competing with Airbus, Boeing had advantages; it was the dominant supplier of commercial aircraft, and its role as a major defense contractor underlined its political importance in Washington. For China to buy from Boeing might help to promote Chinese access to the huge American market that beckoned. For both Boeing and Airbus, but especially for Boeing, political issues with China would always have to be reckoned with. In the 1990s, the issue was whether to keep extending most-favored-nation, or MFN, treatment to China in trade. Then as now, China was running a heavy trade surplus with the United States, but without MFN the surplus would have shrunk significantly. It was equally true that if China had chosen to buy the majority of its jet airliners from Airbus, the U.S.-China trade deficit would have been very much larger. The Chinese were hardly subtle in their use of aircraft deals as leverage in the campaign for MFN renewal. Late in 1992, United Airlines announced it was postponing delivery of 122 Boeing airliners worth $3.6 billion. On April 7, 1993, United disclosed that it was deferring delivery of another 49 Boeing aircraft worth $2.7 billion. But on April 9, just two days after the second blow from United, China placed an order worth $800 million for 20 Boeing airplanes, all narrow-bodies. And from Beijing there also came a strong hint of a follow-on order for a similar number of the pricier wide-bodies, both 767s and the 777s on which the company thought its future might depend. While sales by Airbus to Chinese airlines have continued to lag behind Boeing’s, each of China’s chief long-distance carriers are now buying aircraft from both suppliers. Two-thirds of the aircraft delivered to China in 2004 were from Airbus. But in sales of airliners with a hundred seats or more, Boeing had roughly 70 percent of the Chinese market at the end of 2005. In the next twenty years, Chinese airlines are expected to triple their fleets, adding 2,300 aircraft worth nearly $200 billion. The big Chinese airlines now have more to say about aircraft selection and procurement while continuing to need the central government’s approval. Gaining official approval depends heavily on external politics. On this point, contacts between China and France are instructive. In January 2004, China’s president, Hu Jintao, made a state visit to France during which he was shown a cabin mock-up of Airbus’s A380. His host, French president Jacques Chirac, made comments about Taiwan to please Hu. In turn, Hu noted a purchase by China Southern of some A320 family aircraft a few days earlier. The meeting probably led to an order by the Chinese six months later for 20 A330s, Airbus’s midsize aircraft. Four months later, Chirac returned the visit. China was expected to announce the purchase of several A380s while he was there. But that didn’t happen, probably because France had been unable, or hadn’t tried, to lift an arms embargo imposed in 1989 as punishment for the crushing of the democracy movement at Tiananmen Square. In January 2005, China did make the long-awaited purchase of five A380s. Long-distance air travel had become a more immediate concern for the Chinese, largely because they would be hosting the Summer Olympics in July 2008. Airbus and Boeing did what they could to make the most of the moment. Airbus pushed to expand sales of its entire family, from the A320 at the low end to the superjumbo A380. Boeing competed hard against the A320 with its 737, but its larger effort was directed toward selling 60 of its new 787s. Boeing’s efforts to sell the package were waged in Washington as well as Beijing. The U.S. presidential campaign was under way, and Boeing was trying to conclude the 787 deal before the election. That didn’t happen, but later, Bush and Hu did discuss the 787 package. In January 2005, it was approved. During Bush’s visit to Beijing in November 2005, China signed an agreement to buy 70 Boeing 737s and announced that an order for another 80 would follow. In Japan, Airbus feels that Boeing continues to benefit from intervention on its behalf. “We have discovered that [Mitsubishi Heavy Industries] has on occasion pressured JAL [to buy from Boeing] when its airplane was competing against us,” an Airbus vice president says flatly. His use of the term “its airplane” reflects MHI’s strong involvement with Boeing, along with the heavy subsidies it receives from the Japanese government. Early in 2005, Airbus was holding little more than 1 percent of the Japanese market, and that share was heading toward zero. Reprinted by permission of John Newhouse. Excerpted from Boeing Versus Airbus: The Inside Story of the Greatest International Competition in Business by John Newhouse, 2007. John Newhouse covered foreign policy for The New Yorker, served as assistant director of the U.S. Arms Control and Disarmament Agency and, during the Clinton administration, was senior policy adviser for European Affairs with the U.S. State Department.